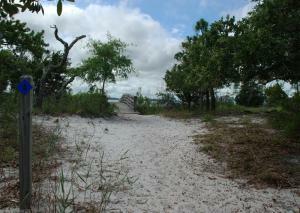 Nearly 9 miles of trails wind through a variety of distinct habitats at Carolina Beach State Park. Relatively flat and easy to walk, the trails offer an opportunity to observe the diversity of plant and animal life in the park. Insects may be plentiful during the warmer months; repellent is recommended. 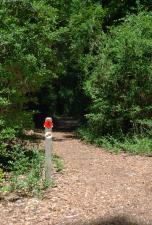 To avoid becoming lost, stop by the visitor center or marina for a trail map. Pay close attention to trail markers. Horses are not allowed on the park's trails. This trail begins and ends at the visitor center and briefly joins the Sugarloaf Trail. 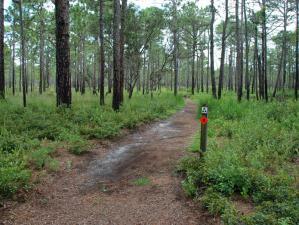 Much of this trail winds through a coastal fringe sandhill forest, dominated by longleaf pines and live oaks. This section of the Snow's Cut Trail is designated as a self-guided trail for kids. Activity brochures may be found at the picnic area trailhead and at the family campground trail access near campsite #20. This wheelchair-accessible loop has several exercise and activity stations set up along the way. 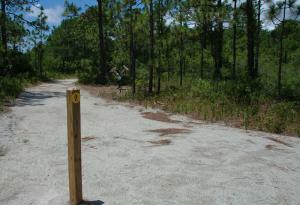 This trail is located off of 7th Street, with parking at the Carolina Beach Recreation Center. 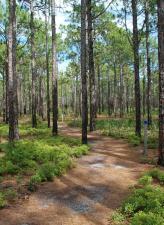 This wheelchair-accessible trail loops through pocosin wetlands and longleaf pine and wiregrass savanna communities. Venus flytraps can be seen along the edges of the pocosins. (Please stay on the trail to avoid damaging these small and fragile plants). Wildflowers bloom along the trail. Parts of the trail travel along wooden boardwalks. This trail spurs off the Sugarloaf Trail and journeys to the Marsh Overlook. It offers views of the Cape Fear River and brackish marsh and sightings of fiddler crab, dwarf palmetto and oak toe lichen.